In this interview, Sean Anderson talks about his experience devising, developing and marketing his own English language learning card game, Question Quest. He describes the challenges he faced, and the risks involved, and offers advice to others hoping to create their own language learning games. 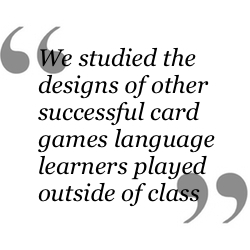 What initially inspired you to create your own language learning card game? Frustration. I had a student who would not participate in the conversation circle activity I did regularly in class. I finally got him speaking with some homemade cards he could read from. Each card contained a single question, some example answers for the question, and an image pulled from the Internet to illustrate the question’s purpose. But then I had another student who frustrated me as well. I would ask him questions, and he would just look at me, smile nonchalantly, and say, “I don’t know.” At the time, I was still producing new homemade question cards for my classes. Thinking of the student while I worked on the cards, I joked to myself that I should make a card with his picture on it and put the words “I don’t know!” at the top. Then I thought, What if I did make an I don’t know card? That was when the basic idea for Question Quest formed. 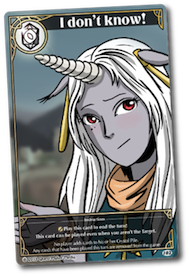 Can you explain the process of going from your own handmade card game, to something professionally published and distributed? After play-testing for months, I demoed the game for a very good friend of mine who was a graphic designer with a lot of English teaching experience. He saw the game’s potential, so we partnered up, and formed a company. Next we found an artist with a strong knowledge of English and experience living in Japan. We also hired a game consultant, editor, and a translator. We studied the designs of other successful card games language learners played outside of class, and then started designing our cards. We produced several prototypes and play-tested them. We changed the design several times before we finally found what we, and most importantly the learners, felt were perfect. Then we started meeting with distributors. What were the main challenges you faced in this process? How did you overcome them? The biggest challenge was having to be patient…really really patient. From idea to product, Question Quest took three years. We overcame this challenge by supporting and encouraging each other while we worked. Financing Question Quest was a challenge too, but my team and I believed in Question Quest. Every time we completed another wonderful piece of art, every time we would come up with another brilliant design idea, and every time we saw students’ eyes go wide at the sight of the cards and then saw them work hard to use their English to win during another play-test, we knew we were making something special. Question Quest was worth every yen of risk. On the other hand, play-testing, which can be challenging for a publisher, was easy for us. As a teacher, I had access to students of all ages, and my boss at the time was supportive of innovation in the classroom. How can Question Quest assist language teachers and learners? Question Quest improves language learners’ ability to ask and answer questions found in everyday English conversation and standardized English tests like EIKEN and TOEIC. As learners work to earn points, they try their best to speak in accurate and complete sentences without teacher prompting. This improvement and hard work happens because Question Quest differs from other language card games on the market today. Many language learning card games use the rules of Go Fish or Crazy Eights and therefore can be played and won without the use of English. Question Quest, on the other hand, was built using the rules of English conversation. 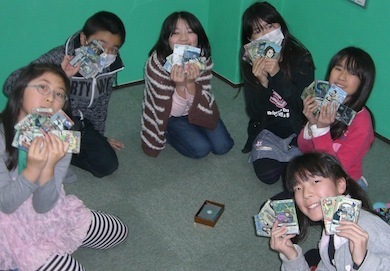 If a player wants to play, let alone win, they must speak English. Question Quest cards are handy for language teachers too. Each card can be the focus for a lesson. They can serve as a diagnostic tool to assess a learner’s language level. They can be used in oral interviews. They can engage new learners in demo lessons. They also make awesome collectable trophies to celebrate learner success. And of course teachers and learners can use the cards to make up their own language learning games! What advice would you give to anyone hoping to publish their own language learning game? 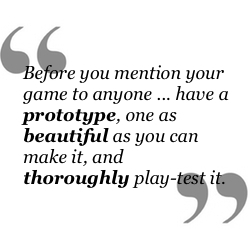 Before you mention your game to anyone who can help you get it on the market, have a prototype, one as beautiful as you can make it, and thoroughly play-test it. Before I spoke to anyone about my game, I put together my own prototype and play-tested it until the cards were ratty from use. You may have the greatest idea for an educational card game ever, but if you have nothing tangible, tempting and tested to show people, you’re just wasting their time. Sean Anderson has been a teacher for over 15 years. He came to Japan in 1999 and has taught students at the elementary, high school, and university level. He currently teaches junior high school and high school students at Senzoku Gakuen in Mizonokuchi. He lives in Chigasaki with his wife and two sons.